This was the second piece of card that I dipped into the puddle of ink on my craft mat. This is the last of the cards I made all on one inky afternoon! Previous cards can be seen here and here; and the full description of the inky process can be found here. For this piece, I stamped the little flowers with Versamark before I started the inky process. Since the Versamark resists the ink, they remain white. 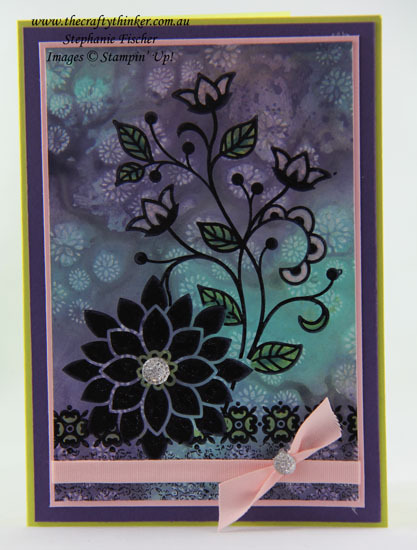 Once the background was dry, I stamped the images with Basic Black Archival Ink and made sure that was dry before I added some more colour to the stamped images with Stampin' Write Markers in Powder Pink, Lemon Lime Twist and Tranquil Tide. To weight the bottom of the card, I stamped one of the Background Bits images with Elegant Eggplant ink. I only wanted a thin line of ribbon on the card, so I applied adhesive to one side of the ribbon and folded it in half. My lovely friend, Satomi, taught me to make the little bow substitute with a piece of ribbon and some glue dots. The Faceted Gems provide the final bit of lift to the finished card.